Ajay Devgn-produced Helicopter Eela starring Kajol and Riddhi Sen attempts to bring onscreen a sweet yet stifling form of parenting. While the movie, an adaptation of Gujarati play Beta Kaagdo by Anand Gandhi, gets the context of ‘helicopter parenting’ right, it’s dismal and insipid plot lets it down. Directed by Pradeep Sarkar, the film starts with a jittery Kajol visiting her son’s college in Mumbai. However, five minutes later we are sucked into her past— she was an aspiring playback singer. This flashback lasts 30 minutes with Shaan, Illa Arun, Baba Sehgal, Anu Malik, Mahesh Bhatt making appearances and helping in her short-lived time as a singer. Later her loving lyricist husband (Tota Roy Chowdhury) chooses to leave her and his young son after realising that every male member in his family dies by the age of 38. Left alone with her son Vivan (Riddhi Sen), Eela’s helicopter parenting, a form of parenting where one feels the need to forever hover over their child, takes off. Despite the storyline promising a new Bollywood take on single parenting after the likes of Nil Battey Sannata (2015), Paa (2009), Karan Arjun (1995) and Bhavna (1984), the movie does little justice to the genre. Mitesh Shah and Anand Gandhi’s screenplay dumbs down the effects of suffocating parenting to keep it simple and rainbow coloured, with Bollywood romanticism taking over reality in the end. Vivan’s frustration of having an obsessive mom who shadows his every breath is given space only through Amit Trivedi’s music and Swanand Kirkire’s lyrics in ‘Mumma Ki Parchai’. The script rarely develops Eela beyond her craziness for her son, her love for dabbas and a forced self-discovery. Her omnipresent vivaciousness feels overbearing even to the audience. As for Vivan, Riddhi Sen’s National Award-winning acting skills seem wasted on a character not given enough space to act. Poignantly, personal space is what he fights for. But his character falls prey to a terrible storyline. The background score of the trailer promises comedy and fun, but it delivers neither. 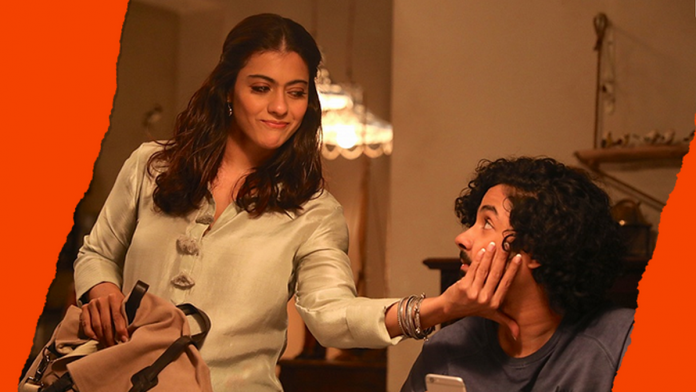 Kajol’s “I am a cool yet persuasive mom” act compiled with blunt dialogues score little. Her mother-in-law, played by Kamini Khanna on the other hand, does pack in a few giggles. Bollywood believes parents are always right. The film doesn’t want to contest that notion. It wants to explore the usually ignored problems of toxic parenting but does so in the background. Helicopter Eela fails to crack the code of the intricate love and hate relationships that was craftily shown in the 2015 Bengali film Icche by Shiboprosad Mukherjee and Nandita Roy. A single parent and a single child form a bond of co-dependency. One only wishes that the film showed more of these moments as we have seen in Shoojit Sircar’s Piku. Director Pradeep Sarkar is a master of emotions as is seen from his past films like Laaga Chunari Mein Daag and Mardaani but his touch remains subdued in Helicopter Eela.